Guest Author: Kristen Ethridge – New Release! Jessica here: Today I’m handing the mic over to one of my BFF writing sisters, the wonderful Kristen Ethridge! Kristen is part of the Treasure Harbor novella series and I asked her to stop by and share an excerpt of her book so you see a peek of it before it releases on Monday! I am *loving* this series. Has anyone else been reading them? Hello there, InspyRomance! I’m so excited that my friend Jessica Keller invited me to come and hang out with all of you lovelies today! It’s been a while since I’ve been here and it’s so fun to be back. So, it’s the start of July. Basically, we are halfway through 2016. That’s pretty hard for me to believe, since I had a baby at the beginning of the year. Halfway through the year means he is halfway through his first year. I think time needs to slow down! One of the goals I set for myself for this year was to team up with some other amazing authors that I admire in some collaborative projects. And I’m super excited that on Monday, July 11, I’ll see that goal come to pass! 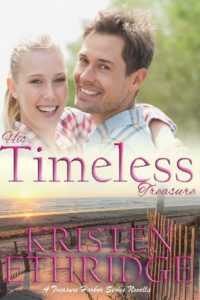 My story, His Timeless Treasure, will be the fifth book in the Treasure Harbor novella series, alongside stories from Belle Calhoune, Leah Atwood, Patricia PacJac Carroll, and Angel Moore. It’s been such a fun project to write this story about pirates and treasure and true love, all set in the Outer Banks of North Carolina. This is my first story not set in Port Provident—but it was still set on a beach, so there’s that! I can’t get too far away from sand and sunshine. I really enjoyed exploring the relationship between college history professor Bree Burton and national weather anchor Reid Knight as they look for the pieces of the legendary Treasure Harbor riches. Both of them have their reasons for seeking the answer to the treasure—Bree’s motivation is centuries-old and Reid’s is in the here-and-now. But each learns that secrets kept can lead to misunderstandings and effects which are far-reaching. To celebrate achieving my mid-year goals, I thought I’d share the first scene from His Timeless Treasure with you. “For the love of pizza. Just stay put, will ya?” Dr. Bree Burton gave the sliding pile of books a shove to emphasize her current state of frustration. She wished the books had ears, because just once today, she needed something to do what she needed it to do—even if it was just as small as a row of hard-bound books staying upright and in a line. There. They seemed balanced. Maybe they did have ears after all. Maybe one thing was going to go right today. Bree pushed aside a stray tendril of hair that had escaped her ponytail. She was coming to dread Tuesdays even more than Mondays. As far as she could tell, Mondays were getting a bad rap. They’d never done anything to her. But Tuesdays…Tuesdays were the enemy. They were staff meeting day. She had been so grateful for the opportunity to come back to her hometown and teach at Carolina Harbor College—a combination of two things she loved dearly. But almost as soon as she’d hung her diplomas on her office wall, a clique of her colleagues had started treating her as though she were still an undergrad instead of someone who had two advanced degrees, post-doctoral study at Oxford, and a tenure-track position. She was only a few weeks into the fall semester, but already it felt like the last straw. The unearthing of the legendary Burton/Callahan treasure earlier this year out on Bounty Beach had turned the whole department into a bunch of amateur treasure seekers—much as it had done for everyone in Treasure Harbor. With a specialty in archaeology, Bree probably held the distinction of being the only professional treasure seeker in town. And as a descendant of Drake Burton, the pirate who stashed the gold bars along the North Carolina coast in 1717, she probably ought to care more about the hottest news story in town since the secret marriage between the pirate and Camilla Callahan, the daughter of Treasure Harbor’s founding family. She was done with drama. Through. Finis. Kaput. She’d grown up in Treasure Harbor, a Burton in a town that had seemingly always known angst and tension between her family and the Callahans. She’d packed up and moved to New York for grad school, where she became a laid-back, small-town Southerner who valued a nap now living in a northern metropolis that never slept. And to top it off, she was the middle child in a family best identified for the social scheming between two divorced parents. Drama was practically her middle name. But no more. She was a grown-up woman with a grown-up job. She was not about to allow office politics to color this new phase of her life. For once, Bree Burton was going to define herself on her own terms. And it started with this treasure nonsense. She wasn’t going to go treasure crazy in her classes, like several of her colleagues were. Sure, the treasure’s reappearance represented local history. But Bree had no interest in teaching her students about the feud that had marked her family as the villains in Treasure Harbor’s story for generations. If anything, Bree wanted to minimize the talk about the Burtons and their history around town. She could, however, place the sense of fear that he’d probably heard her talking to herself. Slowly, she pivoted on the ladder step, praying her face wasn’t red as she turned more fully to face the visitor. “I’m looking for Breanna Burton.” His voice was low and measured, giving a depth to her name she hadn’t heard before. It was almost like listening to liquid milk chocolate call to her. In fact, he was yummy. She tried not to stare. That wouldn’t be professional at all. That would be what a drama llama would do. And she was not going to be that llama. Nope. “I’m Dr. Bree Burton.” She tried her hardest not to sound like a chocolate-craving drama llama. Her chocolate fantasy melted. A reporter. Her childhood friend, Lara Callahan, was a reporter, and Bree had sat down recently with her for an interview. But aside from her trust in Lara, Bree tended to think that nothing on earth dragged along drama like reporters. Always looking for a story, looking for ratings, looking for any detail that could bring them fame and viewers and all that kind of stuff. And all that was basically everything that she was not interested in right now. But that did explain why he looked so familiar. She’d watched a lot of National Weather News when Igor, last year’s much-talked about nor’easter, blew through town. She hadn’t yet relocated back to Treasure Harbor, so the only way to get information about the mess left behind in her hometown was through the nation’s leading weather-related channel. “How can I help you, Mr. Knight?” Bree started to climb down the ladder, then her foot missed the last rung and the slick sole of her ballet-style flat slid. Suddenly, she knew without question that her face had turned red as she was awkwardly propelled backwards into the corner of her desk. So much for not being a part of drama. She was a one-woman drama machine. She kind of hated herself right now. She gestured out toward the hallway where the other professors’ offices were. Bree wanted to tell him “too bad, so sad” or some other highly professional phrase, but something about the way he stood in the door made her bite back the sarcasm. Something in the way he stood in the door reminded her of Josh. Reid Knight didn’t look anything like Josh. He didn’t sound anything like Josh. And there wasn’t much comparison between a TV weatherman and a Navy SEAL sniper, but Josh had never taken no for an answer—and something about the set of Reid’s shoulders told Bree that he wasn’t going to, either. A breath escaped from between her lips like a gentle sea breeze. Her heart squeezed a bit. She was surprised that even after three years, she still felt sometimes like he was going to walk through the door and flash that smile she’d depended on for so long. It surprised her even more that she thought of a total stranger in the same way she thought of her former fiancé. Well, not a total stranger. After all, he’d been in her living room for days while Igor roared through North Carolina. He’d been her lifeline to the people and events back home. Maybe that’s why she felt this peculiar sense of familiarity. Maybe it’s why she decided that she could answer whatever questions he had. Josh would have done the same. He always tried to help others. Even if it meant diving in front of two young Afghan girls to shield them, then subsequently taking a fatal bullet in a firefight no one saw coming. “So what exactly are you looking for, Mr. Knight?” Bree faintly rubbed the sore spot on her back as she spoke. “The truth? Are there lies?” She cocked her head slightly, trying to figure out what exactly the reporter was getting at. He gave Bree a strong stare. She felt like she was on camera, being interviewed. But more than that, she realized he was right. Ever since returning to Treasure Harbor, she’d been defined by what others thought of her. Her brother still thought of her as the little sister to protect—even though he was technically younger than she was. Her colleagues thought of her as the undergraduate they’d taught years ago. And the residents of Treasure Harbor thought of her as the descendant of the rogue who’d tried to ruin the town’s founding family. As a historian, Bree knew things weren’t always what they seemed to be. Neither was she. And neither, she would bet, was Drake Burton. She slowly sized up the man in the doorway once more. He had access to some of the most powerful tools in the world—television, print, social media. What if she could solve the mystery of the treasure, and in the process set the record straight about Drake Burton? What if she could definitively show the history professors she worked with that her commitment to study and history was just as bona fide as theirs was? What if she was no longer the peacemaker, stuck between warring parents, brothers, co-workers and opinionated neighbors? What if Bree Burton became a rainmaker? And what better way to make it rain than to pair up with one of the most famous faces in weather? I hope you’ll join me in Treasure Harbor on Monday. Click this link, which will take you to my Amazon page, and His Timeless Treasure will be listed there as soon as it goes on sale! What were your resolutions for 2016? Halfway through the year, where are you on them? Have you achieved them? Are you stalled out? Are you making more? Treasure Harbor: Seven novellas centered around a quest to find treasure hidden by a notorious pirate, Drake Burton, in the 1700s. When Nor’easter Igor unearths gold coins on Bounty Beach in the Outer Banks seaside town of Treasure Harbor, North Carolina, treasure seekers from near and far converge on the town in hopes of finding riches and the secret of a lifetime. This series from some of inspirational romance’s favorite authors features heroes and heroines who are dealing with the fact that their beloved town has gone treasure crazy. Dr. Bree Burton has returned to Treasure Harbor, North Carolina, to find a way to set the record straight—even if the record goes back three centuries. As a Burton in a town founded by the Callahans, the bookish history professor has always felt like the black sheep of history in her hometown. By returning to teach at her alma mater, Carolina Harbor College, she hopes she’ll be able to find a way to clear the name of legendary pirate Drake Burton and restore her family’s reputation in the process. But while the whole town’s gone treasure crazy after the Nor’easter Igor unearthed gold bars on Bounty Beach thought to be part of the legendary Burton/Callahan treasure, Bree is determined to remain scholarly and logical—and not get caught up in the craziness. National Weather News’ anchor Reid Knight accepted the fact that he’d been dispatched to Treasure Harbor to put together a pilot for a reality series which would uncover the truth behind the secret treasure that had gripped the town—as long as he was able to keep a secret of his own. He’d spent some time in Treasure Harbor covering the large weather event of Igor last year, and had some theories about Drake Burton, his star-crossed love with Camilla Callahan, and the treasure that had been part of the town’s history for hundreds of years. But in order to connect all the dots, he needs help from the one person in town who can make his show a success. Bree realizes that the access Reid has can help clear her family’s name once and for all. Along the way, though, both Reid and Bree come to find out that there’s truth and lies in all legends—and the same is true in their own lives. When they finally realize things aren’t what they seem, will they risk it all to clear the Burton name and make the mark on their own respective futures, or will unearthing the secrets they’ve found threaten their families and their chance at the most timeless treasure—true love? The writing bug bit Kristen Ethridge around the time she first held a pencil. A 2012 Romance Writers of America Golden Heart Award Finalist, Kristen was discovered by Harlequin through their 2012 So You Think You Can Write contest. Kristen is the award-nominated author of the best-selling Port Provident series with Harlequin’s Love Inspired line and Laurel Lock Publishing. The first two books in the Port Provident: Hurricane Hope series, Shelter from the Storm and The Doctor’s Unexpected Family, each reached No. 1 on the Amazon Hispanic-American literature chart. Welcome Kristen! Growing up, my family always vacationed in the Outer Banks, so I’m excited to read. Timeless Treasure, along with the other novellas. Great cover! The cover is a winner for sure! New life goal: Family reunion in Fiji! The best part is I’m an only child, so all I’d have to bring would be ME! HA! I hope you enjoy it–please let me know if you have a chance to read it while you’re on vacation. It will be up on Amazon either late Sunday (US time) or early Monday, just depending on how the Amazon bots process it. :) If you do get to read it, it may be the first time one of my books has ever been read in Fiji. I’d love a pic! Thank you for sharing about the next story in this series. They’re definitely on my to be read list but I haven’t got around to start them. The mystery is really intriguing though. I also realized that unfortunately we’re already halfway through the year and this year seems to be “marchin’ across my face.” I feel like I’m constantly running around to catch up and not making much progress. Priscila, know that you are NOT alone there! I find myself daily thinking I’m never going to check off everything on my to-do list. I find that a lot of prayer and reminding myself to just make peace with it and do what I can in the moment helps a lot. I hope you’re able to pick up the Treasure Harbor series–it’s been very fun collaborating with the other authors on these books! I generally don’t make resolutions. If I did this year this year, I’ve forgotten. I don’t make them because I never keep them. I can’t believe we are more than half way through the year! Where does time go? Love the cover. congrats on your new release. I tend to adopt themes more than “make resolutions,” Kimberly–it helps with the “not keeping them” thing and also helps me prioritize–if it doesn’t fall into my theme, maybe it just isn’t so important after all. Love your writing voice, Kristen! I hope someday you’ll be back at Inspy Romance as a regular blogger. :) I also hope this series does well. I have a couple of them on my Kindle already. I can’t wait to see how the Treasure Harbor series does. I think doing an indie continuity like this is such an awesome idea. Oh thank you, Autumn! That makes my day! I hope you enjoy the rest of it just as much! Isn’t Kristen’s writing so fun? Her characters are always so quick and keep me grinning while I read. Thanks for the intro. I love reading about new books and new authors. But I just gotta say Kristen, as nice as you look you are totally wearing the wrong colors! Ha! See I’m from Alabama and a true Crimson Tide football fan, go Crimson and white! You are wearing our fierce rivals colors, Auburn, orange and blue. Thanks for sharing. I’m not a resolution kind of gal. Right now my goal is just to get back to my normal activities after dealing with an injury. Merrillee, you and me both. It has been a long five weeks right now with some stuff here on the Kristen front. I’ve been reading your updates on FB and praying for you. I hope you’re back out on the tennis court soon! Thanks for sharing the start of your story. It does sound good! I did not really make any resolutions this year, except to lose weight. But I hope to do that every year!! Thanks for stopping by Kristen! You were a wonderful guest and I’m drooling to get my hands on this book! YAY for Treasure Harbor and Kristen!!! I loved His Timeless Treasure and your writing voice is fabulous. I’m so happy to be working on a project with you. Can’t wait to see this take off. Blessngs. So glad to read your story. I finished book 4 on Friday. So i am really excited for yours even more so after you shared this. Have a great weekend. Since I don’t make resolutions, I did set a “goal” of sorts for myself. My goal was to get at least halfway through my physical book TBR pile. Well, I honestly don’t know if I achieved that goal yet, but I DO know for a fact I’ve read 51-1/2 books this year already! Half a book because that’s the book I am currently working on :-) And that, according to my Pinterest book review board, I’ve written 78 between this year and some last year!